Nothing fills up your belly like a plate full of pasta. Whether it's a bowl of creamy homemade macaroni and cheese or some fine Italian dining, a good pasta dish is a thing of beauty! This original set of return address labels features four of your favorite kinds of pasta next to secret recipes for mouth-watering cuisine. 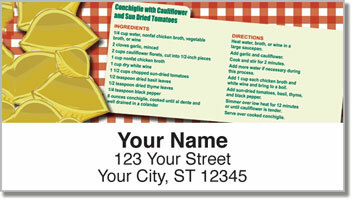 They're an excellent choice for folks who love to cook as well as those of us who love to eat! 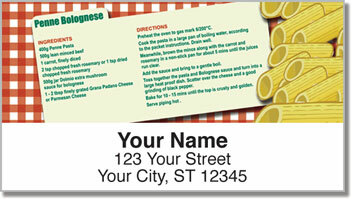 Pasta Recipe Address Labels from CheckAdvantage will give your outgoing mail the look of a charming Italian restaurant. The only thing that's missing is a bottle of wine! 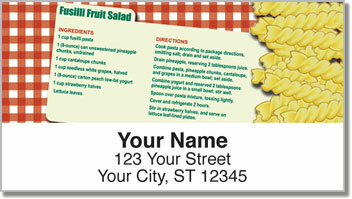 Stick them on every letter and package you send to save a ton of time! Why write your name and address on every envelope when these convenient labels let you peel and place thanks to a self-adhesive backing. 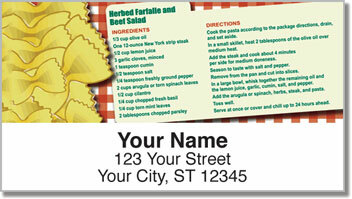 Order your very own Pasta Recipe Address Labels today! Don't forget to check out the matching checks.